Not only are we starting the first day of the second moon, but we have also entered into a new heptad ( week) and wavespell of 13 days. It is kin 92 Yellow Magentic Human. 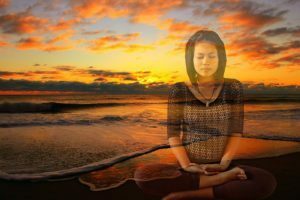 Kin 92 – Precept 40 – Spiritual self-sufficiency is a function of discipline which is a continuing spiritual sacrifice of the lower self for the sake of inner perfection, or the coming out and polishing of the divine incarnate self or form within. 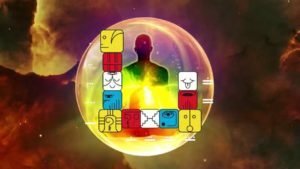 Moon 2, day 1 – Knowledge is revealed and given for awakening the human before death so that he/she can realize cosmic being now. Heptad 5 / Precept 5 – The program of the 13 Moon calendar is a radical step, which is the whole purpose of Cosmic History – to lead the soul back to the divine perfection of the order of the universe as it actually is. Yellow Human Wavespell is a cycle of 13 days from Gregorian Dates August 23rd to September 4th. 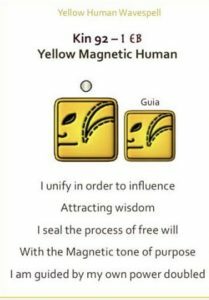 Yellow Human Qualities: abundance, harvest, open vessel, quickening, cornucopia, free will, choice maker, responsibility, chalice, emptiness. Yellow Human asks you to strengthen and clear your physical vessel in order to prepare for the expanded energies of higher mind. Your chalice of self is being purified through vibrational adjustments in the brain/body system. With this quickening, adjustments are made and your circuits of consciousness are naturally transformed. Often this process is accompanied by the sensation of being altered or “rewired”. Higher centers of the brain and the light-sensitive pineal and pituitary glands are being activated to contain more light. This penetration brings you to a critical threshold, creating enormous change at the cellular level. It also activates soul memories and expands your concepts of reality. The Harmonic Wisdom of Yellow Human is resonance, the quality of sounding again. When you strike a tuning fork, another tuning fork next to it will begin to resonate in response because of its similar vibrational makeup and structural attunement. When you are being the vibration of all that you are, a natural resonance is set up for your chalice to be filled and your world to become fully resonant.